"This is such a great dish! You can get creative by adding more options like water chestnuts, nuts, green onion, shrimp... the list is endless. This recipe was a accidental mixture that has been a hit over and over." Preheat the oven to 375 degrees F (190 degrees C). Lightly grease a casserole dish. Stir the milk, sour cream and cream of mushroom soup together in a large bowl. Fold in the green beans and spinach, and mix in about half of the onions. Pour into the casserole dish and top with the remaining onions. Bake uncovered in the preheated oven until bubbly and browned on top, about 40 minutes. The classic is deliciously fresh! My family loved last weekend - am making again this morning as a side for our Thanksgiving. I used frozen spinach instead of can and also added a little minced garlic. Delish!! I followed the directions to the tee. The dish was bland, the texture was not pleasant, and seemed a bit dry. Perhaps I made an error, but I won't be trying this one again. I made this recipe by the instructions posted. 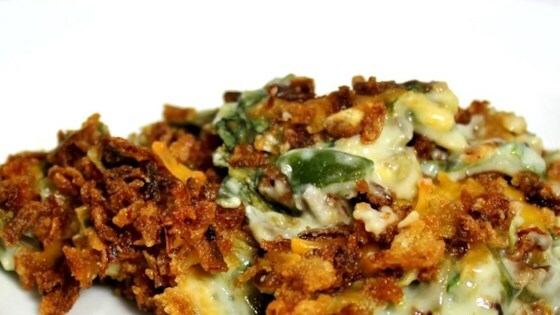 This is my new favorite casserole for sure! OH YEAH!